I love the process part of making an architectural rendering in watercolor. (See more examples here.) Frankly it isn't that different from the process of making a digital rendering. It's still--and always will be--about emotion and storytelling. Great right brain stuff (or is it left brain?). But the process itself satisfies the opposite problem-solving part of the brain as well: how do I save my client the most time and money while producing the maximum emotional effect? Sometimes it starts with something as basic as photos taped together and scanned. 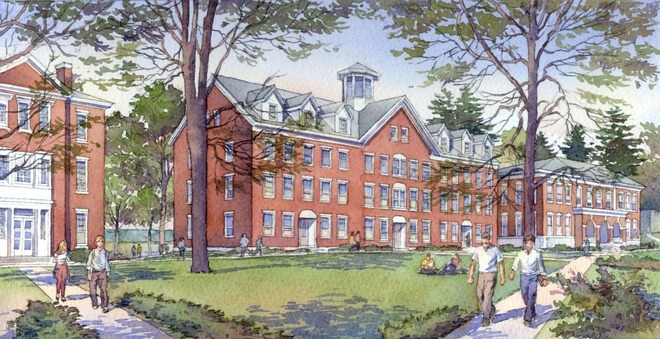 This project for Hampton College--one of a series of renderings for a proposed master plan--shows a sensitive scheme by Shepley Bullfinch for the renovation of an existing "background building" along Main Street. As always, click on images to make them (much) bigger. Enjoy more images like this in the Process section of this website.